Collagen (or gelatin) + a good source of vitamin C can make your tendons and ligaments stronger. This may help you return to play faster. Take this combination 60 minutes before activity. It takes 30 – 60 minutes for the amino acids in collagen (namely proline, glycine, lysine, hydroxyproline, and hydroxylysine, which are building blocks of collagen, the primary protein in ligaments, tendons and bone) to peak in your bloodstream. This way they will peak right when the pumping action of joints (from physical activity or physical therapy) delivers blood and therefore nutrients including these amino acids and vitamin C to your tissue. You need vitamin C to build collagen. A glass of juice or an orange delivers plenty of vitamin C. You don’t need a supplement. Large doses of vitamin C are not beneficial for muscle and can delay the process of building new proteins in muscle after resistance training. Training with fast, explosive movements builds stiffer tendons. Stiff tendons make athletes explosive (I think of it like a pogo stick; anyone else play on these when they were kids?). Tendons connect a soft tissue, muscle, to a hard tissue, bone. Therefore, tendons must be more pliable near the muscle and stiffer as they get closer to the bone. Stiffer tendons have more molecular crosslinks connecting collagen to fibrils. This ability to stretch near the muscle helps protect the muscle from injury by absorbing shock. Tendons that are too stiff are more likely to be injured (think of an old rubber band that is stiff, pull it too much and it may break). If you have a tendon injury, your physical therapist or strength coach might have you do slow movements (eccentric movements – lengthening the muscle, like the downward phase of a biceps curl; isometric holds). These movements increase collagen content but decrease collagen crosslinking in the part of the tendon closest to the muscle making it more pliable and therefore less prone to injury. 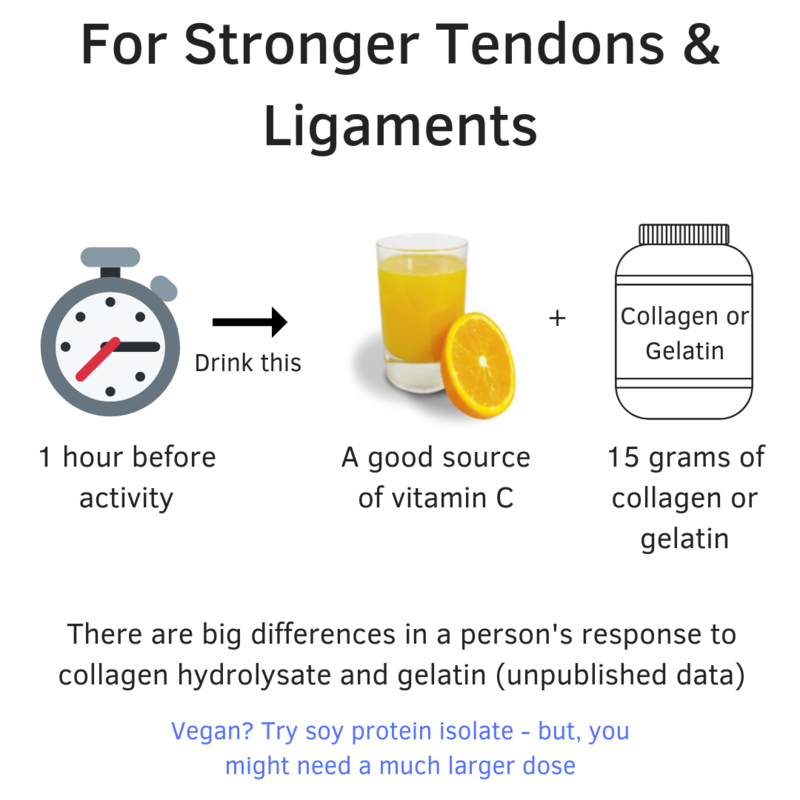 Take collagen / gelatin + a source of vitamin C beforehand to further benefit collagen production in tendons. Ligaments connect bone to bone. They need to be stiff to resist injury. Collagen synthesis in ligaments (and bone) is maximized by intermittent bouts of up to 10 minutes of activity separated by 6 or more hours of rest. Your physical therapist or rehab specialist may have you performing < 10-minute bouts of activity targeting the injured tendon or ligament separated by 6 hours before another bout. Be sure to take collagen or gelatin + a source of vitamin C 30 minutes to 1 hour beforehand to improve collagen synthesis even more. There are huge differences in a person’s response to collagen hydrolysate and gelatin. Expect more coming out soon from Keith Barr about this. Heating destroys vitamin C so, jello won’t do the trick (unless you already have a sufficient amount of vitamin C in your body). Vegan? Try soy but, you need a lot more to get higher doses of these amino acids (around 58 grams of soy protein has the same proline and glycine as 15 grams of gelatin). Interesting tidbits: Lack of physical activity makes tendons stiff. An athlete with a boot on his leg may feel very explosive once that boot comes off. In women, when estrogen is high during the menstrual cycle there is decreased crosslinking of collagen in ligaments leading to decreased stiffness of ligaments and greater chance of ligament rupture (ACLs etc.). Am J Clin Nutr 2017;105(1):136-143. If warmer weather and fresh air send you into tidying mode, don’t forget your pantry. Spring clean your pantry and refrigerator and you’ll make better food choices and improve your health in the long run. 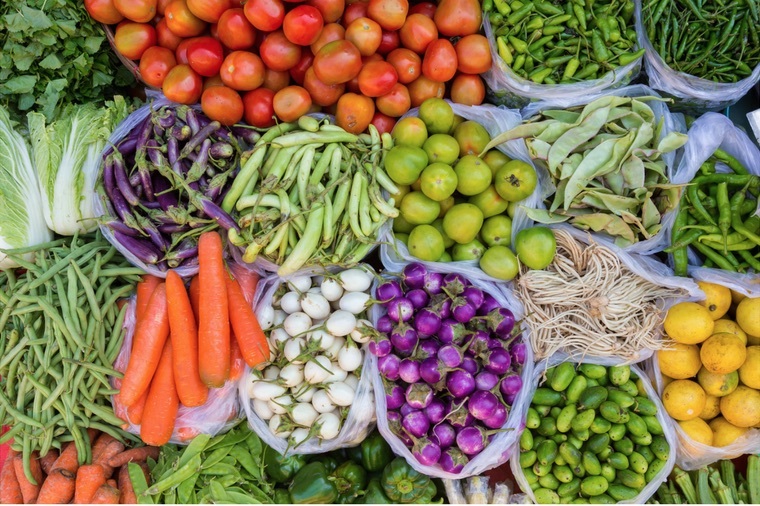 The colorful compounds in fruits, vegetables and grains protect plants from diseases and pests. In your body they help protect your tissues including skin, bone and muscle, from harm. Think of all forms of produce and grains in a variety of colors (see below). Fresh, frozen, 100% juice, dried or roasted veggie snacks and dried fruits with no added sugar (I often turn to figs and raisins when I want something sweet). Orange fruits and vegetables may be protective against bone loss. Black, deep red and dark purple produce and grains (examples: black rice, purple carrots, 100% grape juice made with Concord grapes, 100% pomegranate juice) are good for artery health; they help expand arteries to accommodate greater blood flow (very important for maintaining healthy blood pressure). Dark greens are good for skin and eyes. They can help eyes adjust to bright light and also support night vision. Some examples include spinach, kale, turnip greens, collard greens, broccoli, zucchini, Brussels sprouts and romaine lettuce. When you want to satisfy hunger, look for foods high in protein and fiber. If you want to satisfy hunger and taste at the same time, consider options that fulfill your cravings. Looking for salty and crunchy? Beanitos hint of lime chips are amazing with guacamole. Searching for something sweet? Yogurt parfaits, granola + milk (Purely Elizabeth’s and The Toasted Oat are 2 of my favorites). There are also a number of bars that satisfy hunger and taste at the same time. Check out the newest Luna bars including chocolate dipped coconut (you won’t miss Mounds or Almond Joy). Find a few other crave worthy options here. Vitamin D has been the rage for years but there are other nutrients that are ‘shortfall nutrients,’ those most of us do not consume in adequate amounts. Among them are potassium and magnesium. Potassium is important for healthy blood pressure, nerve and muscle functioning and removing waste products from cells. Branch out from bananas and consider including leafy greens, carrots and potatoes and citrus fruits such as oranges and grapefruits for potassium. Think out of the box with kale chips, roasted carrots and potatoes or slow cooker vegetables with potatoes. Magnesium is necessary for muscle and nerve functioning, blood sugar control, bone health, blood pressure regulation, energy production and normal heart rhythm. It also helps with sleep and muscle relaxation. Get a little more magnesium with beans, nuts, seeds, dark green leafy veggies, avocados and potatoes. In addition to focusing on the food mentioned here, place foods you want to consume at eye level and treats you want to eat rarely in the back of the cabinet or bottom of the freezer out of sight and reach. Chances are, you’ll forget they are there.